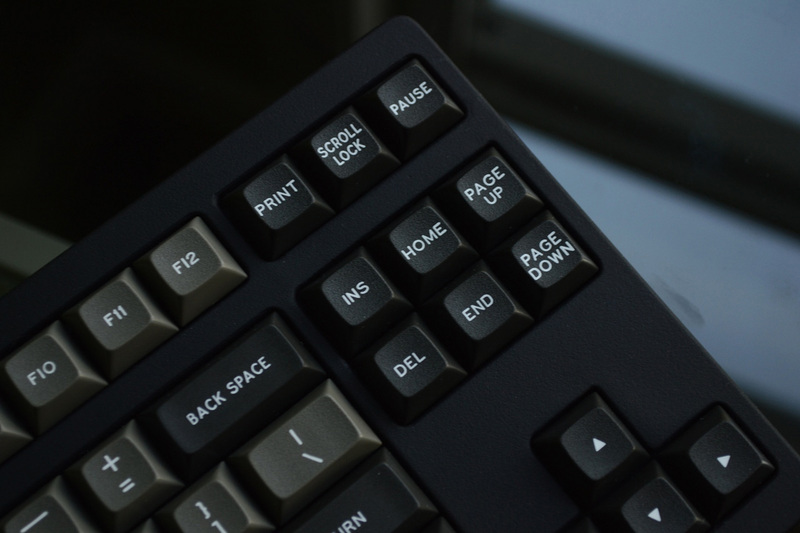 Earlier this year, we asked you to submit photos of your custom Filcos in our ‘Pimp Your Filco’ contest. Just under one hundred enthusiasts entered, showing us their personalised creations. 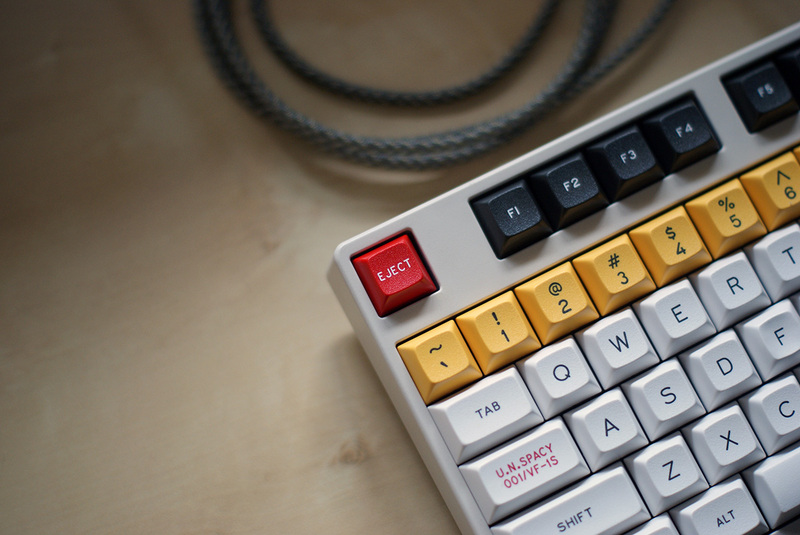 These ranged from simple keycap swaps to much more comprehensive modifications, like case replacements, switch transplants and custom cables. We selected three winning entries, but there were many more worthy entrants. 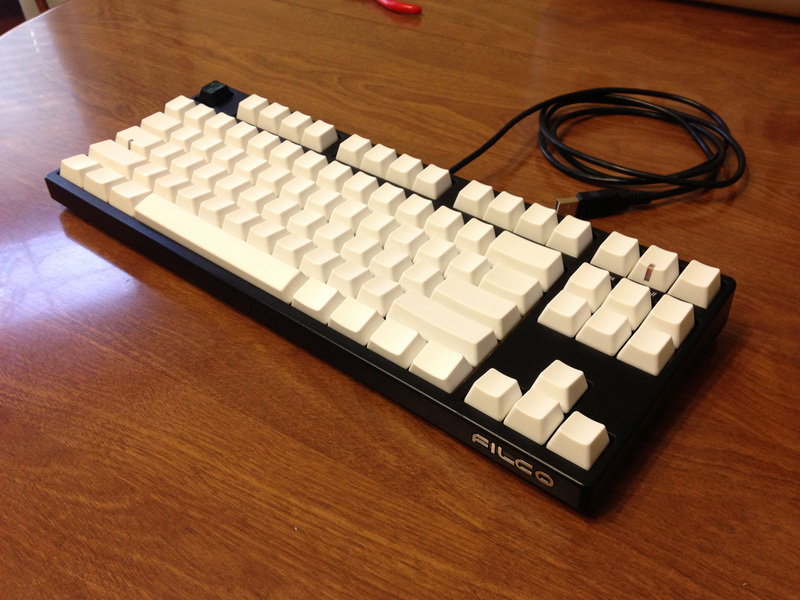 Today, we’d like to show off 11 more awesome custom Filco keyboards, in no particular order. The dog was very hesitant when it came to taking the pictures. 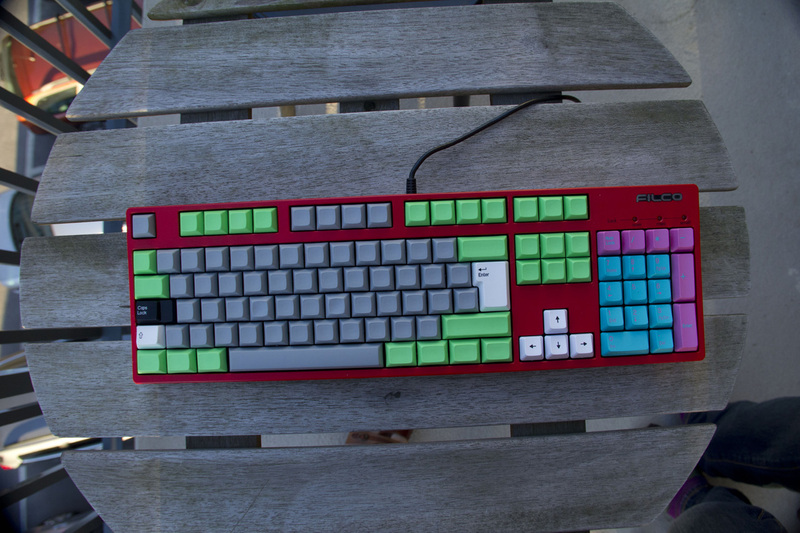 That’s a red switch Filco with DSA gray standard base set with green modifiers, double shot PBT arrow keys and double shot ISO keys from Signature Plastics. The Miami numpad set and stepped capslock were purchased from techkeys. 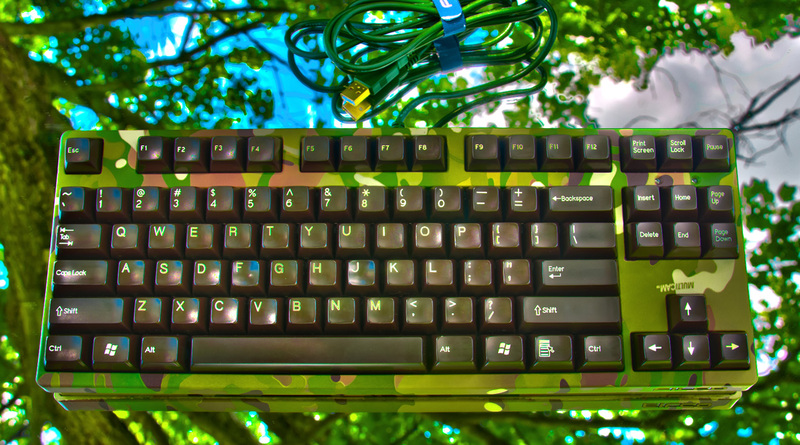 Here is my Filco Majestouch 2 Camo TKL with beautiful dark brown/beige double shot spherical keycaps. 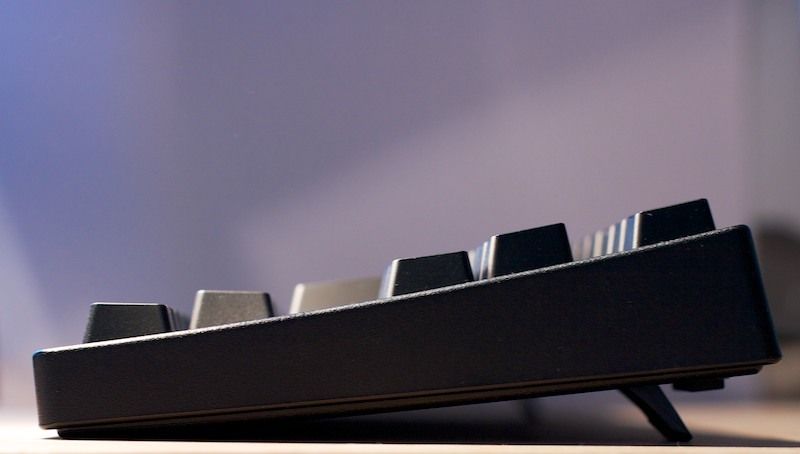 Keyboard is a Filco Majestouch Tenkeyless Linear R – FKBN87MR/CB2. Case is made from 3 layers of solid teak wood, dyed in dark brown and finished with lacquer. Center frame is CNC’ed from a stainless steel grade 304 plate. 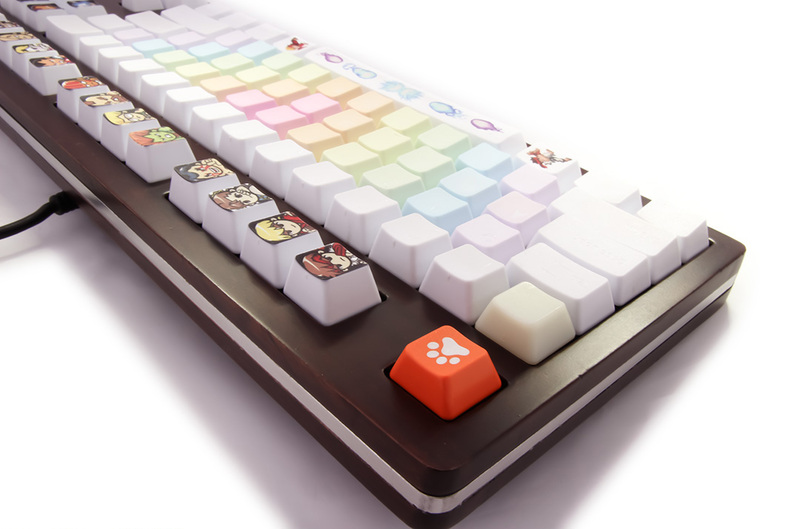 Alpha keys are engraved rainbow KBC PBT + engraved white KBC PBT modifiers + dyesubbed novelty keys + paw Esc key. Haven’t gotten the chance to give the adjustable feet a good finish. Roof is made from clear acrylic, and added a Filco logo as a finishing touch. 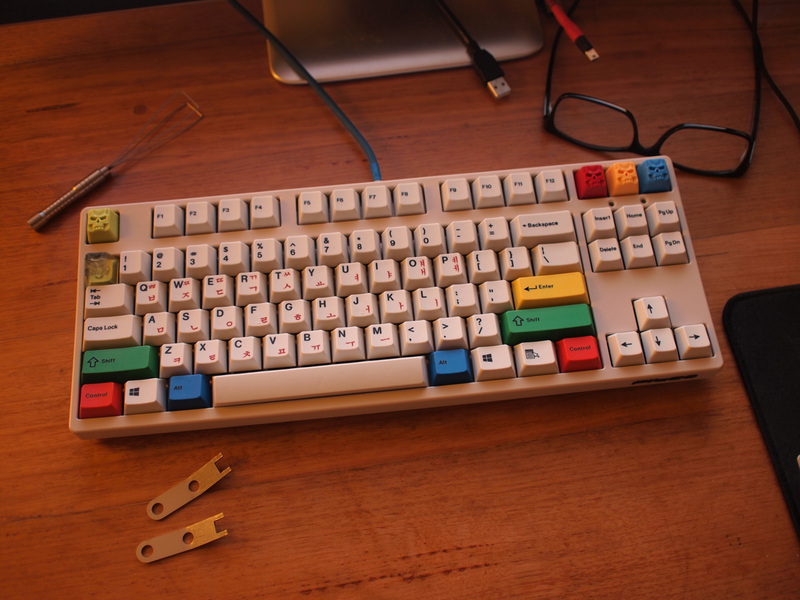 This is my order made Filco, from Japan. “Carbon White” Majestouch Ninja Tenkeyless + Blue Switches, US ASCII Layout. I took a LOT of time to complete the mods to the aluminum case, I stripped the blue anodizing off of it and patched it up with JB Weld. I patched up the LED holes on the upper right side of the keyboard, since I did not like them, and I made the little gap between the top and the bottom case much smaller. I then had to prime it, and paint it. I ended up choosing flat black enamel paint. I then had to decide on what switches I was going to use on it, since I didn’t like the cherry mx blue switches anymore. I decided to go for some modded black switches. 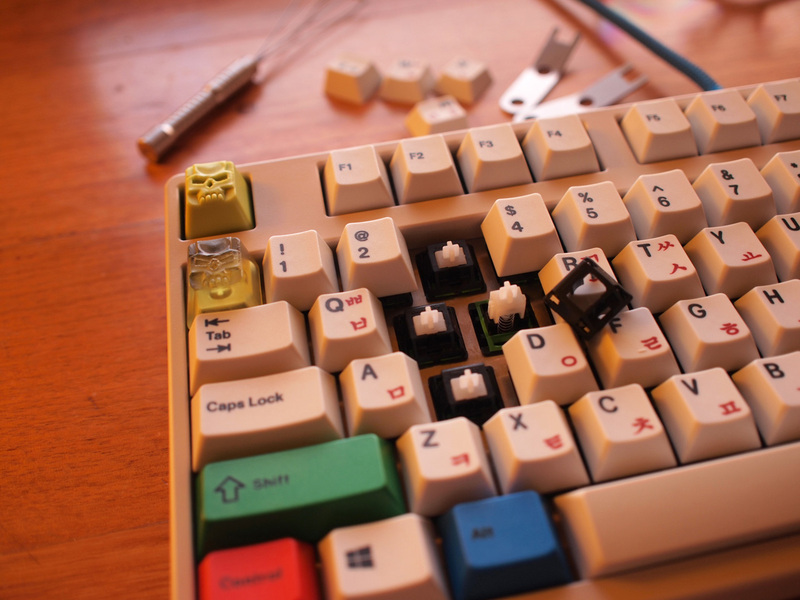 I bought some old, vintage mx black switches, took out the stock springs, and put in 68 gram gold korean springs, and lubed the switches with geekhack thin formula krytox lube. 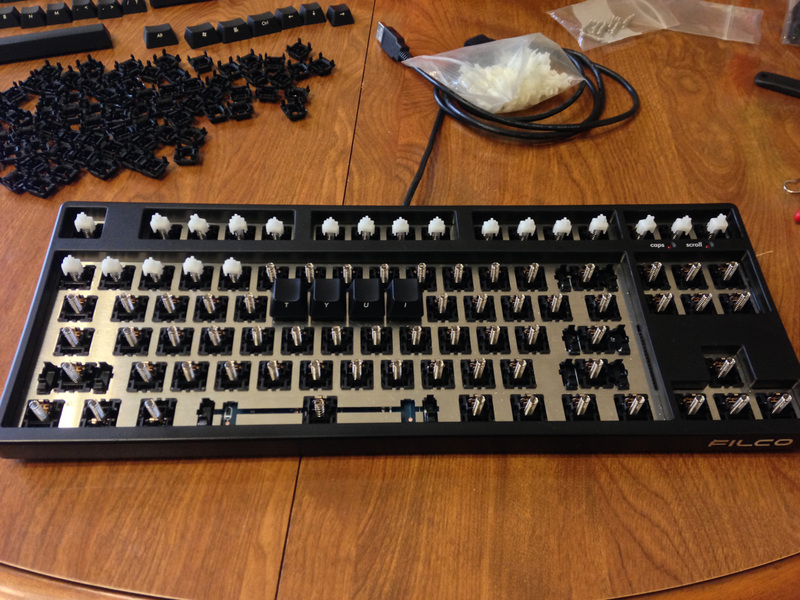 The completed switches feel amazing, they are smooth and sit between the weight of stock mx black and red switches. 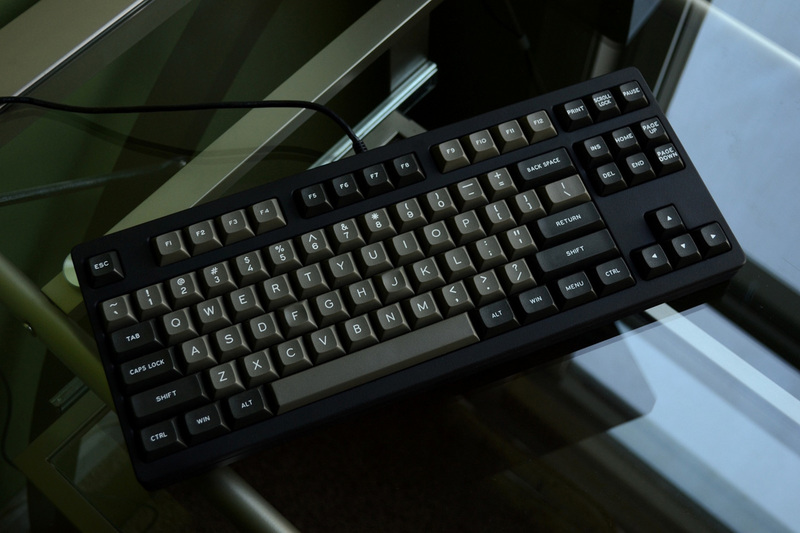 I then put DSA dolch keycaps on it, the end result looks nice and I am proud of this keyboard. 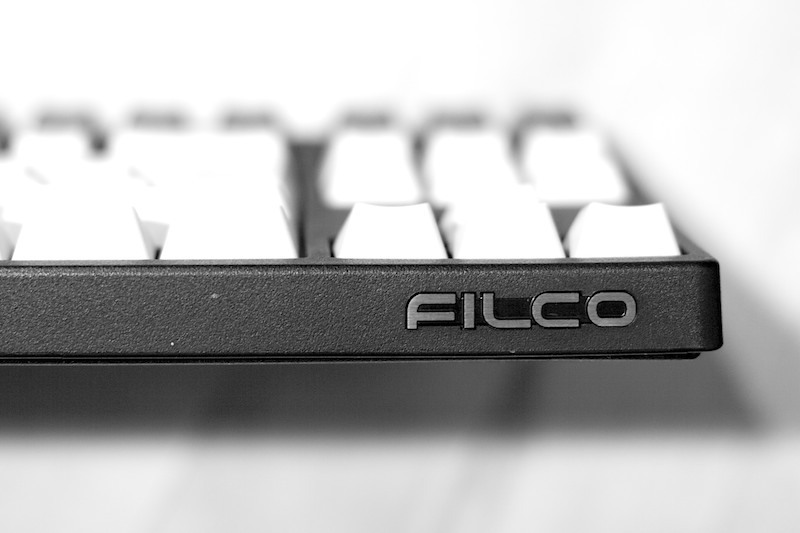 A mod to reduce the height of the lower tray of the Filco case by 3mm. Many more photos at the original GeekHack thread. with MX black switches, lubed, stickered and 45g springs. Hi! 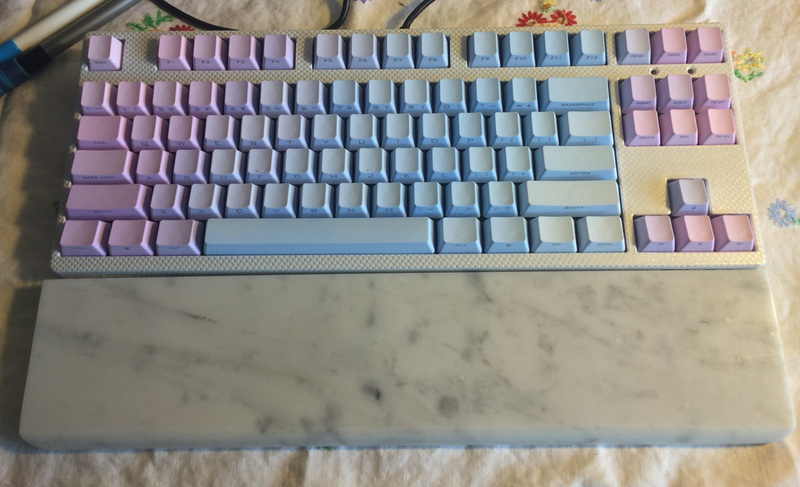 I would like to submit my RGBY Filco with lubed Ergo Clears with KBD 62g springs. I chose elementary colors and primary colors theme because it looks colorful while not becoming rainbow vomit. 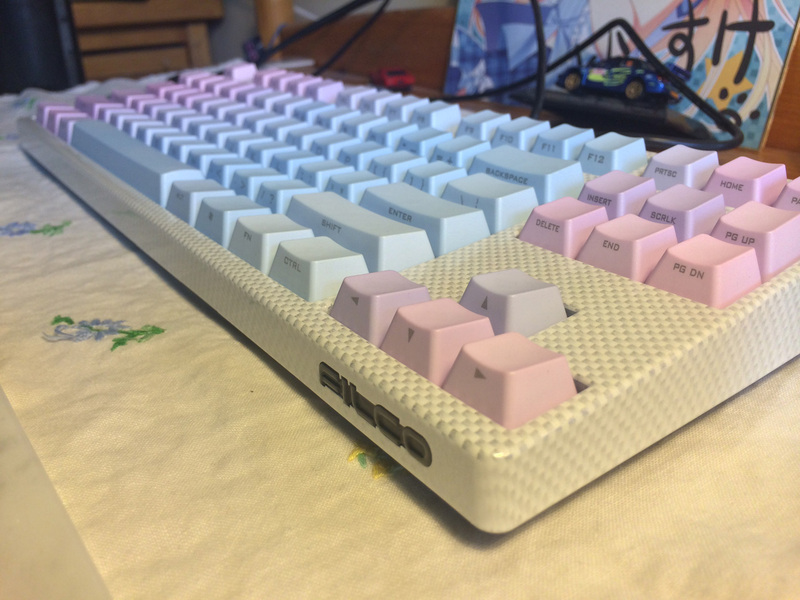 It was the first keyboard I’ve ever modded and it’s still my favorite keyboard to date! Being my first mod job, it holds a special place in my heart, and I hope you’ll be able to see why it’s so special too 🙂 This keyboard took over a year to complete because of funding and limited availability of parts composing this keyboard. – Universal TKL Custom Aluminum Plate – allows for switch opening and modification without the need for desoldering every time. This was done by desoldering the stock Browns off the PCB, removing the stock plate, modding every single switch into Ergo Clears, placing them into the custom plate, then resoldering them all back into the PCB. – KBDmod 62g Springs -much lighter than stock Clear springs but still stiff enough for balanced gaming and typing experience. A lighter spring (55-60g) made it more of a typing keyboard but not for gaming, while stiffer springs made it less desirable for typing. Lubing made so the keys wouldn’t stick even on much lighter springs. – MDPC-X B-Magic Sleeving -I modded the stock white Filco cable myself by cutting the cable at the USB end, stripping the wires, putting on the sleeving, soldering the wires back together, applying electrical tape to each individual wire, taping them together, and then applying heat shrink in the appropriate areas. 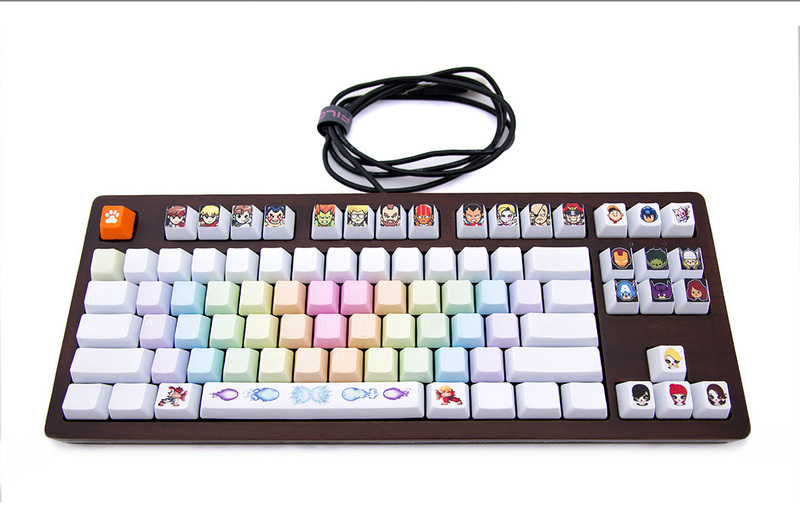 – IMSTO Hangul Dyesub Thick PBT keycaps -Ergo Clears are best felt with thick PBT keycaps to provide maximum tactility with the harder plastic, and the dyesub Cherry replica printing allows for ever lasting pretty letters that will never fade. The plastic is also much more resistant and will not shine easily, if at all. – GMK Doubleshot Thick ABS Modifiers -Chosen in RGBY colors and black legends to match the Cherry font used on the white PBT caps, I chose these high quality thick doubleshot ABS modifiers for their vibrant colors and also ever lasting legends that will never fade. – Click Clack Skulls -infamously rare and expensive novelty key caps. The red, yellow, and blue are together because they form the F2 set. The Green T1 (unique/rare) and the Gummyrot (transparent) were also given as a set. All CC’s were obtained from Click Clack/Factory himself through Flash Sales (F2 set) and Lazer/Dibs (Rot set), making them much more important to me than some of my other novelty caps, and makes me glad I didn’t have to pay the triple digits for them. LOL! – Lime Green Stickers -for mainly appearance but some will argue that it provides stability in the switches by providing support between the switch housing parts. 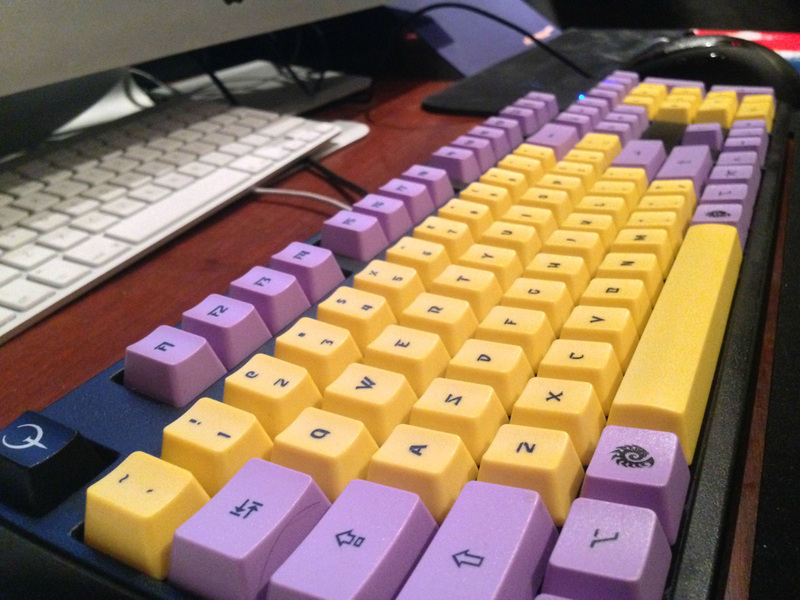 The custom layout is from WASD and is inspired by the Zerg SWARM, with another homage to the most venerable game of all times. I use this keyboard on both a PC and a Mac, and have used the Mac modifiers (command/option, swapped windows / alt) keys for the benefit of my wife who uses this keyboard daily. Filco Majestouch 2 w/ blues. Custom spraypainted, cherry doubleshots and awesome relegendables! 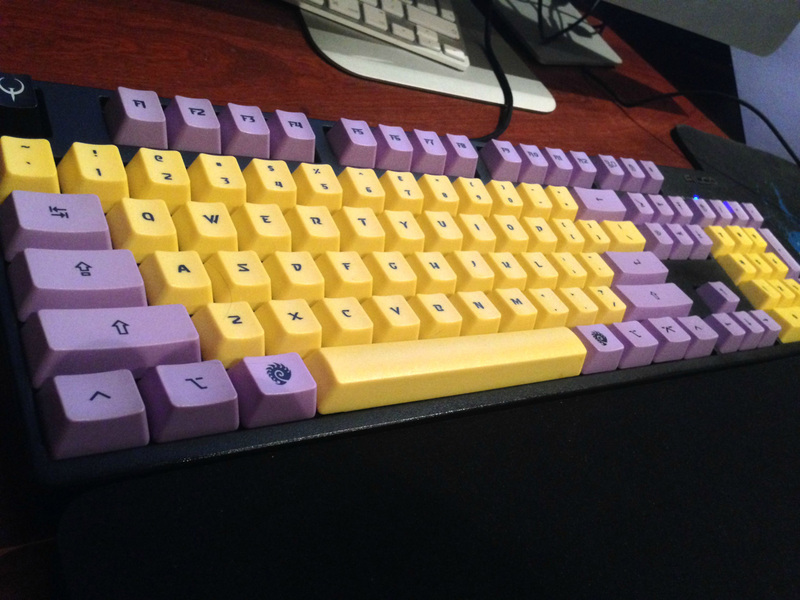 Thanks for checking out the community’s custom keyboard creations! We’d like to continue to build up a gallery of customised Filcos, so please email us with photos and descriptions! 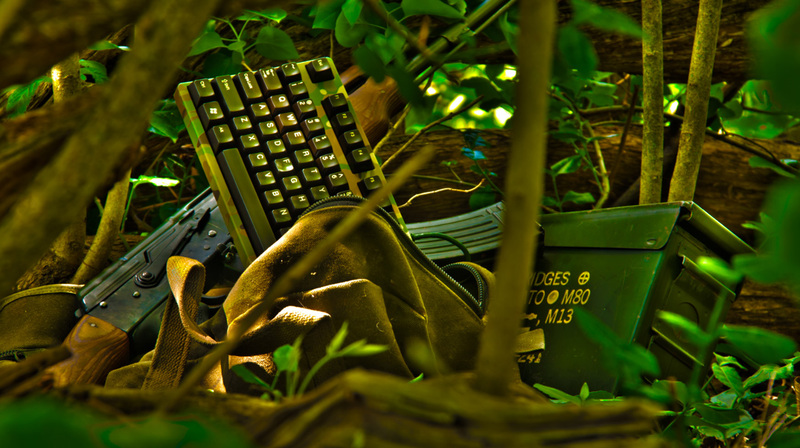 You can reach me at will at keyboardco dot com. You’re board in my opinion was the best. Very tasteful, lots of mods and your explanation was very detailed and informative. 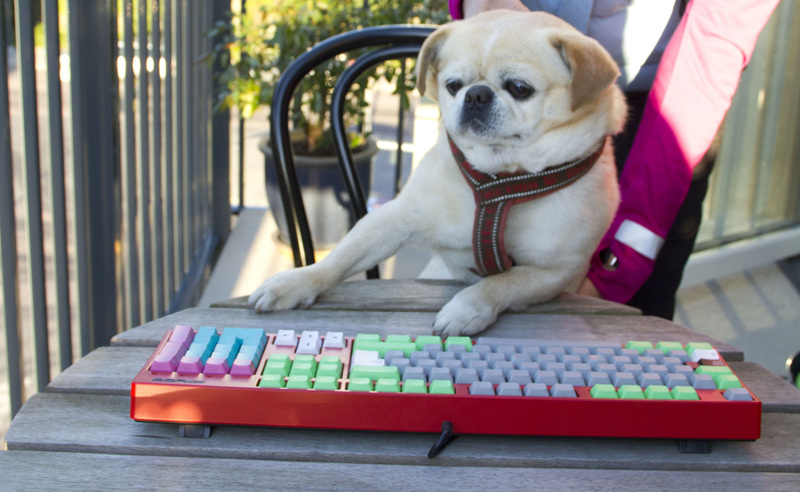 Hey I was wondering where you got that stainless steel plate for your filco, and if the switches mount via the plate or the pcb.